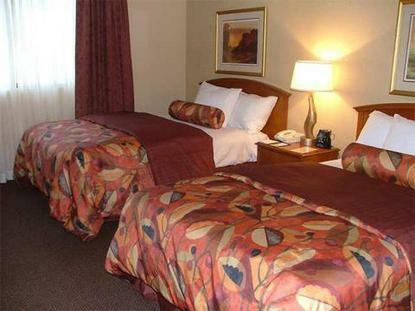 The Embassy Suites Kansas City - International Airport hotel is located just five minutes south of Kansas City International Airport. The hotel features 236 suites surrounding an eight-story atrium. Our amenities and location make it ideal for the leisure and business travelers.The Embassy Suites Kansas City - International Airport hotel is a full-service, upscale, all-suite hotel. Our location makes it ideal when visiting nearby businesses and corporations or one of Kansas City's many attractions.Kansas City attractions near the Embassy Suites Kansas City - International Airport hotel Zona Rosa Shopping & Entertainment District, Tiffany Greens Golf Course, The National Golf Course, Tiffany Hills Sports Complex, The Springs Aquatic Center, Park Hill Indoor Aquatic Center, Worlds of Fun Theme Park, Oceans of Fun Water Park, Country Club Plaza, Hallmark Visitors Center, Kansas Speedway, Arrowhead Stadium, Kaufman Stadium, Sprint Center, Kansas City Convention & Entertainment Center, Kemper/Hale Arena, Swope Park, Kansas City Zoo, Nelson-Atkins Museum of Art.The Embassy Suites Kansas City - International Airport hotel is conveniently located near many of Kansas City's largest businesses and corporations. Located off Interstate 29, exit 10, puts the Embassy Suites within 20 minutes of most of Kansas City's businesses and corporations.Businesses and corporations near the Embassy Suites Kansas City - International Airport hotel General Motors Fairfax Assembly Plant, Ford Motors Claycomo Assembly Plant, National Weather Service, Toyota, Dairy Farmers of America, Harley-Davidson Assembly Plant, St. Luke's Northland Hospital, Ceco Construction, Citibank, Delaval, Haldex, Travelport/Worldpan, Sony.